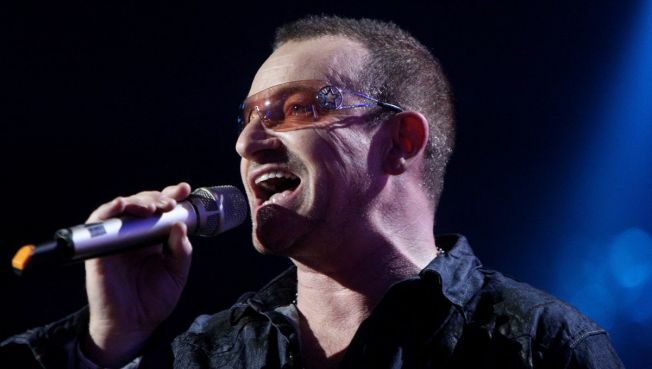 Bono onstage at the MTV Europe Music Awards, held at the Echo Arena on November 6, 2008 in Liverpool, England. Should you find yourself in the market for a physical copy of U2's upcoming album No Line on the Horizon (due March 2) you'll have no fewer than five inane choices: It will, of course, come in standard CD and vinyl editions, obviously, but it'll also be available as a part of three expensive, completely gratuitous box sets; the $36 digipack edition will feature a book, a poster, and a code to download a U2-themed movie by Anton Corbijn; the $50 "magazine edition" will include a bigger book, along with the Corbijn movie; and the $96 version comes packed with a hardcover book, two posters, and the Corbijn film on DVD. All sets will feature music by a band hilariously unembarrassed to squeeze its loyal, moneyless fans during an economic apocalypse.